Although John James was only an agricultural labourer, by the time he was 40 years old he had been able to buy a piece of land and build himself a cottage. The 1861 census gives John James, 48, his wife Mary, 43 and daughter Celia, a 22-year-old dressmaker, their address simply “Coldfield”. A schedule of 1856 shows that the cottage they lived in was on the corner of Highbridge Road; this cottage is still standing, now known as Grove Cottage. In 1856 the ecclesiastical parish of Sutton Coldfield was divided into four new parishes - Walmley, Boldmere, Hill and Trinity (Sutton). Boldmere parish took its name from a seasonal lake called Baldmoor Lake which used to form on either side of Chester Road, and the name “Coldfield dropped out of use; the parish was bounded approximately by Chester Road, Birmingham Road, Goldieslie Road and Sutton Park. In 1856 the parish was estimated to contain 127 houses, most of them less than twenty years old. Some were expensive villa residences, but most of the newcomers were “clerks and small businessmen with salaries I suppose of £100 a year who live in houses below the good class of villas” according to the Rector of Sutton, speaking in 1859. The 1861 census shows 165 households, including forty agricultural labourers, most of whom lived in cottages on Boldmere Road between Jockey Road and Highbridge Road. Twenty years later another 300 houses had been built, but there was still sufficient farmwork to employ the forty-one householders listed as agricultural labourers in the 1881 census. There were many large houses in one or two acres of grounds built for Birmingham businessmen, and their upkeep gave employment to the forty-four gardeners and ten coachmen recorded as heads of household in Boldmere. Grove Cottage remained unaffected by these changes. In 1862 Celia James married Abel Smith, a policeman, and they lived in the cottage while John James, still listed as the owner, moved out. The 1871 census shows Abel and Celia living there with five children. Abel Smith was now a park keeper, and soon moved into Rowtons Cottage in Sutton Park. Grove Cottage was let to a variety of tenants in the next twenty years until Walter Smith, Abel’s eldest son, lived there from 1895 until 1937. Overshadowed by a tower block, surrounded by busy roads, Grove Cottage stands as a reminder of Boldmere’s rural origins. 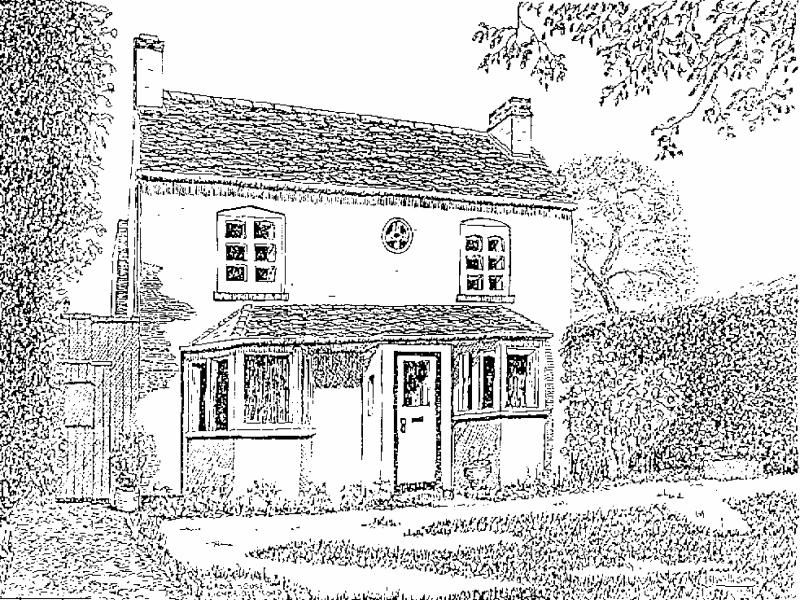 Grove Cottage, sketched by the late Ken Williams in 1991.